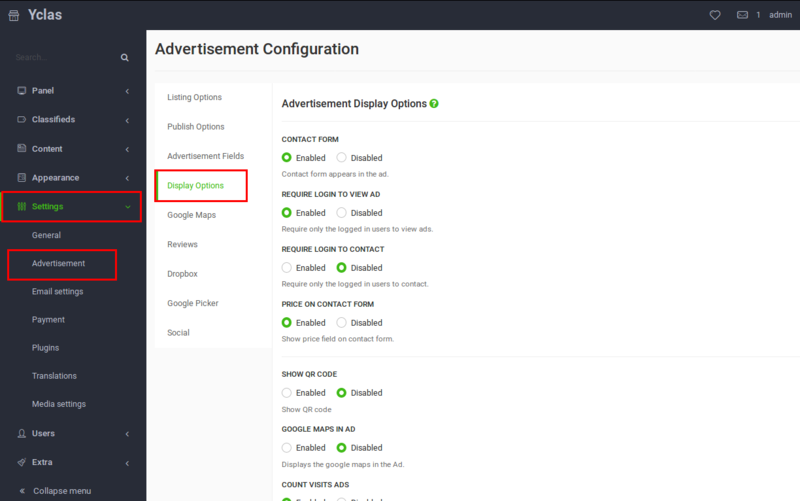 In this section of options you can configure what will be displayed on the advertisement’s page. To access these options, login to your Panel, go to Settings -> Advertisement -> Display Options and fill the fields. Contact form: If you enable this option then a contact form appears in each ad’s page where users can contact with the seller. Require login to view ad: Enable this to force users to login to be able to view ads in your site. Require login to contact: Enable this to force users to login to contact with the seller. Price on contact form: Enable this option to have another field called Price in the advertisement contact form, so the buyer can contact the seller asking about the price. Google Maps in Ad: Allow Google Maps to be displayed on ads which have address. Count visits ads: You can choose if you wish to display amount of visits at each advertisement. Show sharing buttons: You can choose if you wish to display sharing buttons at each advertisement. Show Report this ad button: You can choose if you wish to display Report this ad button at each advertisement. Related ads: You can choose if you wish to display random related ads at each advertisement. Show Free tag: You can choose if you display Free when an ad has no price or price equal to zero. Rich Snippets: Enables rich snippets for products. How to manage Advertisement Fields?